Why did the people on the Jetsons live in the sky? The Jetsons is one of my favorite tv shows, but I don't remember seeing a house on the ground, every building was in the sky. What was the reason for that? I used to believe that maybe the earth was too contaminated to live near the ground. Does anyone know really why? No explicit reason was ever given - it was just a conceit of the series. The setting was 'future' and one of the ways the 60s-era animators wanted to display that - to make it completely unambiguous - was to never show the Earth's surface. An episode of Harvey Birdman: Attorney At Law (hardly a canon source) indicates that they live in elevated homes because the Earth's surface is uninhabitable. Indeed, in that episode, the Jetson's home becomes submerged by a rising sea, and mutated monsters attack it. They return to the past to sue Earth's citizenry for wrecking the entire planet. Also, keep in mind that this was created in the 60s - skyscrapers were all the rage, a sign of the power of humanity over nature. It was seen as 'modern' for people to live in the high rises, and having EVERYONE live in highrises SO high that they can't see the ground made the setting look like a utopia. Sorry for such a late answer, but I wasn't even going to answer until I saw this scene when I had the TV on in the background while I was working. I think it pretty much wipes out a lot of the speculation. They live in the sky by choice, either because they need to leave room for factories or parks, or for other reasons, but now that we have two screen shots showing that the ground is a pleasant environment and one they visit and even play in regularly, there's no indication anything keeps them from living on the ground. They do show buildings on the ground, in at least one case. 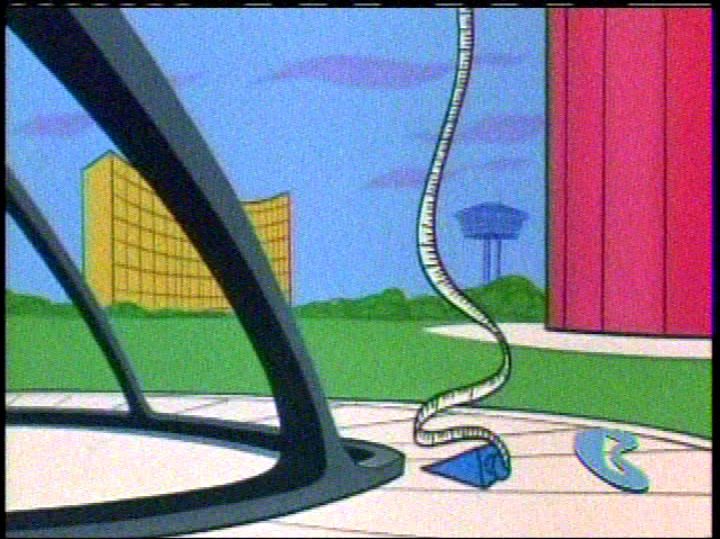 In Private Property, the episode where Cogswell builds a building next to Spacely's, note this scene toward the end. The building inspector measures the building height, and there is a shot of the end of the tape measure hitting the ground. You can see this shows what seems to be a metal sidewalk (judging from the sound of the weight at the end of the tape measure hitting it). There's a yellow building in the background, with bushes and trees around it that doesn't look damaged. The curved beams (of metal or whatever they use) would be supporting Cogswell's building. The red circular pillar probably supports Spacely's buildling and you can see another elevated building in the background. There's no indication of pollution or that the surface is not used. This indicates that it's more likely that with gravity belts and other technology that can make heights safe, they live in the air because they choose to. This one also shows a livable and pleasant area on the ground, so it's pretty clear there isn't an issue with pollution or anything similar. It's because if enough buildings are up high, it leaves more room for factories or other buildings down low and lets them use a lot of the ground area for parks. But that, of course, is speculation. What this does show is that the surface of the Earth is not dangerous or that there's a need to avoid it. That makes a strong case for them living in the sky by choice, rather than need. I'd like to add (much later, after a couple months) that I often have the network that is rerunning The Jetsons in the U.S. playing on my TV in the background while I'm working. I've seen even more episodes that show the ground in screenshots and they all are similar to the shots I've posted. If, for some reason, more screenshots are needed, I can capture them when the episodes air, but I think this makes the point as it is. There is at least one episode where Henry the maintenance man raises the height of the whole building to get it out of the rain. So the height can change a lot. Also there was one episode where a super suit was thrown out and some bum walking on the ground picks it up. Inferring that only homeless bums and the super poor were on the ground, everyone else lived up high and flew their sky cars from place to place. So the reasonable suspicion is that below the clouds is either unlivable or only marginally livable. It's likely from pollution and climate change. Why do the Jetsons live in the air? Because of the Space Needle. Seattle's futuristic-looking Space Needle, a building on a pillar, was built for the 1962 World's Fair. The Jetsons aired originally from 1962-1963. Iwao Takamoto, a layout and design artist on the show, said that animators drew from many sources like architecture and mechanics magazines. ''We'd take those ideas and give it a twist,'' he said last week. The Space Needle in Seattle, he said, inspired the ''skypad'' apartment buildings, whose stilts grew or shrunk depending on the smog. Probably just a way to make it outlandish. Plus it gives a good use for flying cars (instead of them just hovering above the road for no reason). There've been plenty of episodes showing the ground though, so there isn't really anything wrong with the ground. I remember one episode where a bird was walking on the ground, and another where a hospital (that Rosie was in after eating a faulty lugnut) was on the ground with flowers all around it. People probably just migrated to the sky for a fresh start. Or it was just a kick in the series. In the 1990s Jetsons Movie, Rosie, their resident robot, hits a button on the wall of their house that makes it rise out of a layer of smog. They may live in the sky to escape pollution below. This is a much more modern concept, however. 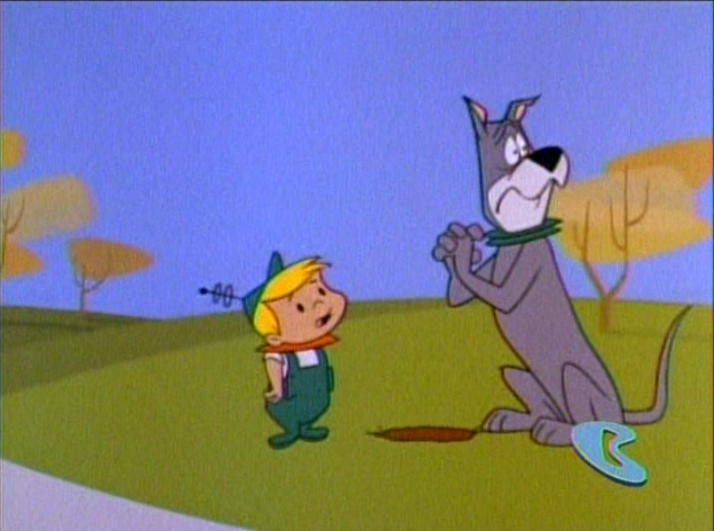 In the original Jetsons of the 60s there is no real reason given for living so high up. It's probably just Retro-Futuristic sensationalism. The answer is pollution. If you watch the 1990 movie you'll see how, when they are sleeping, they sleep at a lower altitude where you can see the sky polluted and the raise the higher. Not the answer you're looking for? Browse other questions tagged tv the-jetsons or ask your own question. Looking for a (TV?) MOVIE about a ship-wrecked far underwater where people were stuck but were able to live?